Adidas are the first brand to use this medium, which will only be available throughout 2014 to tie in with Transport for London’s ‘Year of the Bus’, celebrating 100 years since the launch of the world’s first mass produced motor bus and 60 years since the creation of London’s iconic Routemaster. There are five different livery versions of the New Routemaster, with one vehicle representing each of the participating countries, a total of 32 in all. The whole of the body was painted black before solid vinyls are attached to the bodywork and Contra Vision® vinyls applied to the windows, allowing customers to see out, something TfL felt was particularly important. The vinyls are expected to be changed at the end of the World Cup for a period before the vehicles are then returned back to their original red. This will also be completed by Bus and Coach World who have had to increase production from two shifts to a three shift system to cope with the extra work. As Robert Hilton, Managing Director of Bus and Coach World Ltd explained, ‘We have to produce 25 vehicles in less than a month, that is almost a vehicle a day’. They were awarded the contract on the 2 May and ten vehicles have already been delivered and were launched on Saturday 24 May. The remaining 15 buses will be completed by the end of this month. The New Routemasters will operate on two routes across the capital; the 38, which is operated by Arriva London and runs from Clapton to Victoria Station and is the most frequent route in London with a bus every minute during the morning peak. They will also feature on the number 8, which is operated by Stagecoach London between Bow Church and Tottenham Court Road tube station. In last week’s report on the ALBUM conference, we mentioned Bus & Coach World’s joint venture with McKenna Brothers in which they showcased a refurbished 2003 East Lancs bodied DAF DB250, which has been sold to Sanders of Holt along with another similar bus. McKenna Brothers enlisted the help of Bus and Coach World to come up with something innovative that it could integrate within a bus and also be motivational; matching up with the host, Lothian Bus’s theme of ‘innovate, integrate and motivate’. The fully renovated double decker bus was restored to a nearly new condition by the refurbishment specialists and further enhanced with new vinyls both on the exterior and interior, with full colour graphics not previously seen on a PSV. 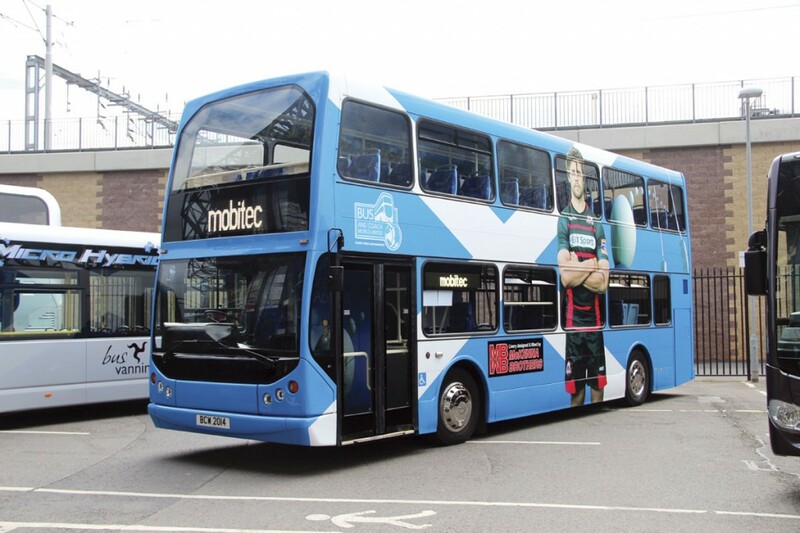 With the conference being held at Murrayfield Stadium, the home of Scottish rugby, the bus featured a 4m high image of Edinburgh player, Izak van der Westhuizen. The decker was completely repainted in the blue and white of Scotland’s national flag, the Saltire. For the interior, the ceilings were covered with a blue sky/white cloud vinyl to give the impression of open space and add light. 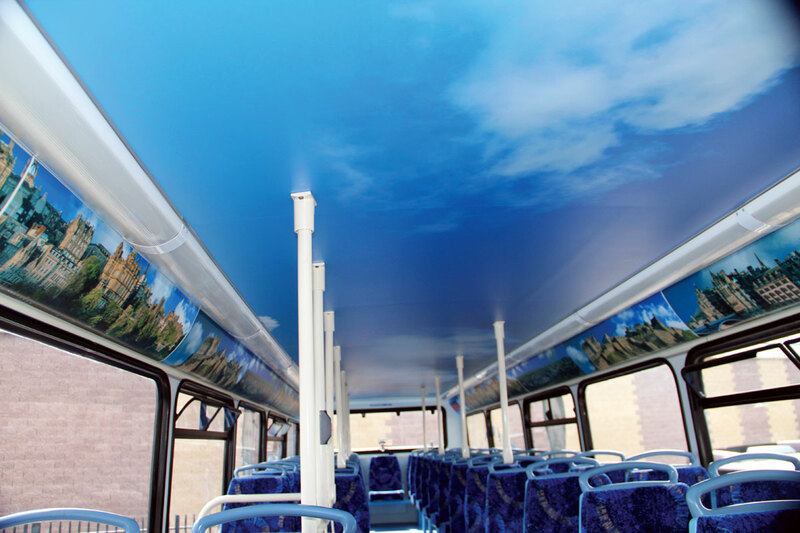 All the cove panels on the upper deck were fitted with full colour images of the city of Edinburgh and surrounding districts, whilst downstairs there was a blue sky welcome aboard vinyl. Contracts for Bus and Coach World continue to come in. They have recently been awarded a contract for converting two ALX 400 vehicles into open toppers for Michael Morton of Arriva Buses Wales, as part of their upgrade in readiness for the holiday season. Further contracts for Arriva include 27 ‘Max’ upgrades on some of their five to six year old vehicles. The work includes new hand pulls, new seats trimmed in E-Leather, Wi-Fi installation and a full repaint in the new livery. 14 of the vehicles are Enviro 400s for Arriva Yorkshire and 13 Wright Geminis for Arriva North East. The company has an ongoing re-trim programme with Lothian Buses and, also in Scotland, is to undertake an open top conversion of a Scania OmniDekka, destined for West Coast Motors’ Glasgow operation.